The Paranormal Activity Franchise continues with this third outing from Paramount Pictures. Oren Peli and Jason Blum return to produce the highly secretive feature with Catfish's directing duo of Henry Joost and Ariel Schulman. I never loved Paranormal Activity films which introduced the "found footage" technique with mystery and horror in it. Well, I actually find it stupid at first. The First movie was the trendsetter but a little bit boring. The second one was by far the worst and still boring. But the third one changed my outlook on the film outfit. Paranormal Activity 3 is the best among the 3 and the scariest as well. Despite my disappointments from the first two films, I still gave the 3rd one a chance. And yes, the movie did not fail me. It gave a series and random of chills, spine-tingling moments and jump-out scares. It still has those boring moments but it was balanced with enough scares that would make this film at par with the other two. 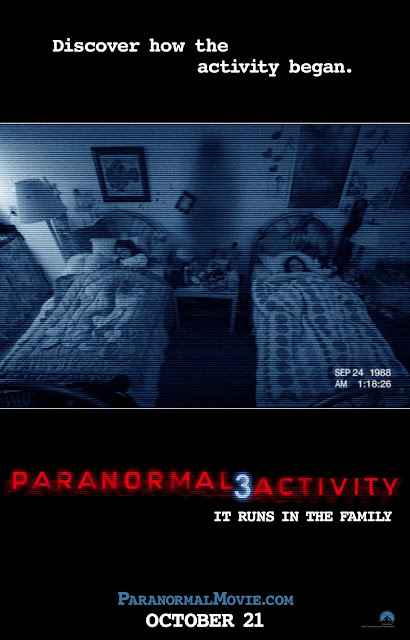 Essentially, Paranormal Activity 3 is the prequel among the two. But I must say, its a worthy prequel and it really gave concrete explanation and answer on how the Activity began. Truly indeed, the tag line "It runs with the family" narrated the mystery of the franchise. I really commend the Writer and the Director for bringing the 3rd Outfit onto a new level of Fear and Suspense as it focuses on children this time. I won't spoil the whole plot of the film but the ending and the connection of all these events are indeed shocking. I loved the kids in the film. The characters are also adorable and it is well-acted. The phasing of the whole film is precise and not draggy compared with the two. The film progresses from silent to a high-tension climax that will really scare the sh** out of hardened audiences. I highly recommend this film to everyone except light-hearted audiences. For fans, you'll be pleased with this one and for first-timer, you'll put this film as an edge-of-your-seat treat that is perfect for this Halloween Season.